Psoriasis is a chronic skin disorder that exhibits three main features: lymphocytic infiltration into the dermis and epidermis, uncontrolled proliferation and abnormal differentiation of keratinocytes. 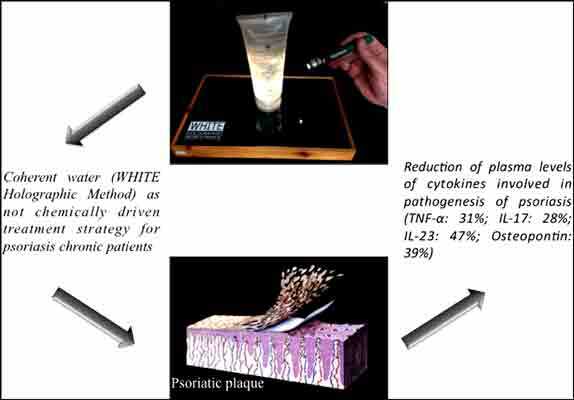 In this study we have evaluated the effect of treatment with WHITE Holographic Bioresonance Method and a resonance-based isotherapeutic remedy on patients affected by chronic psoriasis vulgaris. The WHITE Holographic Bioresonance Method is based on the principles of electrodynamic coherence. By exploiting the phenomenon of bio-resonance, it uses a transfer plate to produce resonance- and light-based isotherapeutic coherent acqueous remedies and gels that emit coherent oscillations which “imprint” the area of psoriasis-affected skin. Levels of proinflammatory cytokines have been evaluated in the plasma of psoriatic patients treated with isotherapeutic remedies. The obtained results demonstrate a positive effect on the natural course of the disease and matched the results obtained by psoriatic patients treated with narrow band UVB. A significant reduction in plasma levels of cytokines involved in pathogenesis of psoriasis has been observed. Our findings may suggest that WHITE Holographic Bioresonance method used in combination with resonance-based isotherapeutic remedy could well be a new useful treatment option for patients with limited psoriatic plaques. Electrodynamic coherence, Isotherapeutic remedy, Osteopontin, Psoriasis, WHITE holographic bioresonance method. Department of Experimental Medicine, Section of Microbiology and Clinical Microbiology, Second University of Naples (SUN), via Luigi De Crecchio n° 7, 80138, Naples, Italy.